Has anyone ever tried to hack F-Zero (SNES) with ASM or similar? Forum Index - Non-SMW Hacking - Misc. ROM Hacking - Has anyone ever tried to hack F-Zero (SNES) with ASM or similar? First off, I know that F-Zero has an editor (Fuzee). I'm trying to create an F-Zero hack, mainly for fun and for learning purposes. 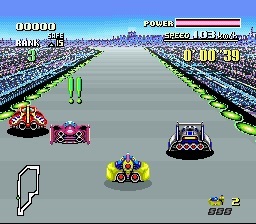 But all the hacks that I see for F-Zero are just custom tracks and that's about it. Just the same plain stuff, no palette editing, no sprite editing, no stats editing. I've made a new document recently, this time it's a RAM Map. I have also found a disassemble tool by the creator of Fuzee (Puresabe I believe), it does a complete disassemble of the rom and comments the output depending on the options file. Sadly the addresses descriptions were in japanese, and Google Translate didn't cooperate much, but I was still able to find plenty of stuff through that (for example, the AI checkpoint info). "CPU Health Patch", adds health to CPU cars so they actually explode. It's still a work in progress but it works pretty good. - CPUs will instantly explode when falling of the track. - Explosive cars will instantly explode when hitting walls or landmines. - You can disable the AI by pressing select, and re-enable it by pressing select again (test feature, will not be present when the patch is completely finished). - Landmines are now exploded when CPUs run over them while offscreen. - Make CPUs actually explode when falling off the track; DONE! - Add health to CPUs (maybe? That would be too hard to do I guess); Partially done! I'm reverse-engineering and hacking F-Zero (SNES)! It would also be nice if F-Zero SNES had a utility where you can create custom songs and use them in your custom tracks in the game! Yeah, I've also been studying a little bit on how F-Zero handles SPC stuff, it uses N-SPC which SMW also does, but SMW has a different N-SPC version (e.g F-Zero has #$E0 for the "set instrument" command, SMW has #$DA). But I was wondering, Earthbound has a pretty nice music editor and it also uses the same N-SPC version as F-Zero, maybe that could somehow be used to create songs? - Modified the pre-recorded race subroutine (Demo race & Master difficulty ending race) to accept inputs for R/L/X/A buttons. - Modified the "run over barrier" subroutine to flash the barrier's palette when a CPU runs over it. I always wondered why that doesn't happen in the original game. - Modified the "hit wall" subroutine to flash the road's palette when a CPU hits a wall. I always wondered why that doesn't happen in the original game. - Make CPUs actually explode when falling off the track. DONE! - Change booster to work like in F-Zero X? Nice palette edits, especially the CPU modifications! Keep up the good work! What a coincidence I found this thread. I do a search on google for "fuzee" every couple months to see if anybody is working on anything and happened to find this awesome thread today. Thanks for the new document CatadorDeLatas! Some really useful new finds in there. I don't think smkdan will mind. Haven't seen him around in ages. As you probably know, he was making a F-Zero course editor and then stopped when Fuzee came out. His had some more advanced options like changing track names, but he never released it. I need to check out that disassemble tool by the Fuzee guy. Can you post a link to it? When I was looking for F-Zero info months ago (like smkdan's site and FennorVirastar's document) I must have looked at every page of the Fuzee guy's website to find any more info he might have posted. When you say it comments the output, do you mean it just writes the opcodes or actually comments on what a routine does? I'm really impressed by your new ASM! Sadly, I barely grasp the basics of ASM. I've tried to do make some MSU-1 music hacks for the SNES, unsuccessfully so far. I'm able to find music registers/song pointers in Geiger's snes9x debugger, but all of the ASM code I write doesn't work. I just sent FennorVirastar an email today to see if he would share his recreated tracks in Fuzee he made for his Legends hack (recreated version of the original game's tracks with harder AI). I let him know about this thread so maybe he will drop by. I'd like to make fzeeclips of the curves to speed up my track making process. most of my time is spent smoothing curves instead of actually designing courses. 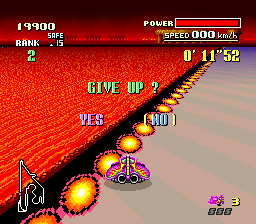 Anyways, mostly all of the F-Zero hacks out there are not fun to play for one reason or another. Either they are too hard, or designed only with Fire Stingray in mind, or don't bother changing settings like the speeds of the cars or their AI (most just leave them all at one of the speeds all the time at every checkpoint). I have been working on tracks in Fuzee for a few months now and want to create tracks that are well balanced for every car, have appropriate difficulty, and smart AI for the cars. I've come up with a few fun courses and hope to release a hack someday that is fun for veterans and newcomers. Maybe you would like to collaborate on something together? 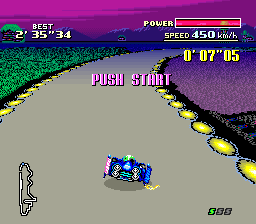 I was able to find the car's sprite palettes using Digisalt's SNES Palette Tools (http://www.romhacking.net/utilities/300/). I may have notes with hex addresses that list each car's palette (this includes the tiny car in the bottom right and shadowed car seen in the car selection menu). I'll see if I can find them, but it's easy enough using Digisalt's program. You may want to take a look at Fusoya's Compress DLL Module (http://fusoya.eludevisibility.org/lc/index.html. It is a decompression and recompression for a bunch of SNES compressions. I couldn't get it to work however, but I think it's just my ignorance on how to run the program. Many of the game's graphics are unfortunately compressed. It features the LC_LZ2 compression used by SMW, which I would think F-Zero would use since they were both launch games. That would be great if ebmused could be used to modify the game's music. 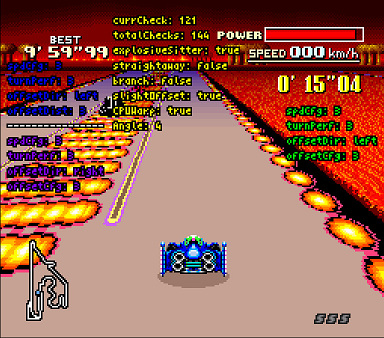 If you had the source code for ebmused you could probably modify it to work with F-Zero. Not sure if another game will work out of the box with the program. Zelda's editor Hyrule Magic also has a neat music replacement tool that often goes unused. This guy Metaquarius has done some music with it: https://www.youtube.com/watch?v=upcUjwskx3A. MSU-1 is always another option for new music. I really like the modifications your doing to the CPUs. It has always bugged me that they all share the same acceleration (I believe Fennor also wrote once that every car's top speed is 478 like the Fire Stingray) and that they don't blow up when they go over the railing. Having the boost work like F-Zero X (I assume you mean having unlimited boost that drains life, aka "risk vs reward") would be interesting. If you haven't check out F-Zero GP Legends and Climax for the GBA. They work that way, whereas Maximum Velocity uses the SNES way of one boost per lap. Honestly though, I've always preferred the SNES method of boosts. To me it has a more strategic angle. Sometimes saving your one boost in case something goes wrong or using it at just the right spot always feels rewarding. 3) Then we wait for the player to select a car. To catch car selection, check memory status at $7E:0055. When it equals 0x03 we know a car has been selected. You can determine which car was selected by reading $7E:005A at this point. The order (from 0-3) is bf (blue falcon), gf (golden fox), wg (wild goose), fs (fire stingray). This is a different representation to what is used internally in the F-Zero ROM, where it is bf, wg, gf, fs. So I change the returned value to suit that. 4) We should not proceed to the game until all players have entered their car selections. So, we wait for the game to start transitioning to the next screen, breaking when $7E:0055 == 0x05. When this condition is met, we halt the screen progression until we receive notification from the server that everyone is ready. In order to pause the game while keeping the music playing etc, we patch the ROM 03/851F: A5 55 F0 74 LDA $55 to become 5C 1F 85 03 JMP 03851F. 5) We only continue when we have received notification from the server that all the players have selected their cars. Furthermore the server will have sent other data such as the track to race on, player id, number of players in the race etc. 6) Then we set the car types based on the data received from the server. The player previously received from the server a player id, this is a unique value from 0 to 3. 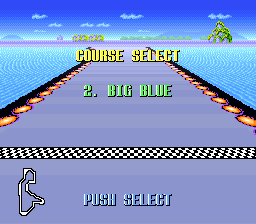 It determines the players position in the starting line from left to right. So, let's assume we are the first player to log on to the server, making our player id == 0. This means, our car will be in the fs position on the starting line, on the far left. However, let's assume we chose bf as our car. 8) Now I need to explain how the F-Zero game actually works. What this means, is we need to make a few more modifications. We need to get rid of the annoying opponent 'catch up' code. As I stated above, the game often decides when a car is about to over take you. It's not like the cars are always racing around the track in a linear fashion. The game may decide to make a car jump from really far away, to just behind you, simply because you are playing poorly. We can't have random 'check' warning messages in our multiplayer races either. We also need to get rid of all the generic enemy cars, these are the ones that have the boring racing stripe and never win the races. If we don't do this, the code will just keep introducing them in to the game everytime we crash in to the wall a few times. 15) We instead set the league and the track number by patching the RAM at 7E:0053 (track number) and 7E:005A (league number). then we read the 16 bit value at 7E:0B70 (this means also 7E:0B71) to get the x value, and similarly 7E:0B90/1 for the y value. The car's orientation is at 7E:0BD1. 17) Once the server has received all the data required, it can instruct the clients to start the race. Each emulator must now send the player's location to the server, while receiving and updating the opponents locations from the server as fast as possible. It should be obvious that the opponent x and y location values are stored in RAM at 7E:0B72/3,7E:0B74/5, 7E:0B76/7 and 7E:0B92/3,7E:0B94/5, 7E:0B96/7. Similarly the opponent orientation data is at 7E:0BD3, 7E:0BD5 and 7E:0BD7 where the order is based on the player id. 19) And there is just one tiny other detail. There is a fifth car. Remember above, I said the AI controls 5 cars at any one time? Well this fifth car is a generic car and we need to remove it. I do it the laziest way possible, I just constantly reset it's location to zero every vsync. Car collisions will not work properly until we make a few modifications. When a collision between two cars occurs, both emulator instances involved try to control both car rebound velocities. This conflict results in jagged movement. a) Make sure that each emulator instance only rebounds its own player during a player-opponent collision by patching occurrences of the code 99 20 0B STA $0B20,Y to NOPs at ROM addresses 00:BDB2, 00:BDD5, 00:BDEF and 00:BDFE. b) Make the player's rebound speed equal to his current speed instead of the opponents speed (which is what happens in the game) by patching occurrences of the code 9D 20 0B STA $0B20,X to NOPs at ROM addresses 00:BDAE, 00:BDCB and 00:BDE5. this is some really nice work going on here though! about F-Zero in general, I often already had an idea what they could change by recognizing certain patterns. Here are a few things that may help you. makes building tracks much more handy. knew from who they were. main cars to the F-Zero2 cars. And one where I changed the 4 main cars in F-Zero2 to the ones in F-Zero1. they can play out their advantages, too. don't seem to care about CPU drivers at all. pads increase your speed properly. speed o meter for some reason is not proportional to actual speeds. slightly lower, so that I have cars that are good or bad at jumping. something like a curb which you are using for tight turns on purpose. That must have taken a long time! But I found very clever the way you made the grid on the maps to be able to build them properly. Even though only Mute City and White Land II were accurate (all the other tracks needed the grid to be 8 pixels higher to be accurate), that might explain why you didn't find all of the original tiles. I was also thinking about the turning speed of the CPUs, but I'm not too sure yet on how to go about that since the game seems to use a fixed value (or maybe not?) depending on the "Turn Performance" bits from the checkpoint properties. the CPU cars top speed. I don't know if this info is correctly because I haven't looked too much into it yet, but it looks like the game has 4 tables for all of the 4 difficulties, and each of these table I believe are divided into 3 sections: Main machines, purple machines and green machines. And about the X-Speed and Y-Speed, I can try looking into the RAM addresses while going fast since I know where they are. When the player hits a dash plate, the game sets a flag, similarly for CPUs, but they use a different flag for some reason. The game actually does what you described, but it also sets an "out of control" flag for your car (the same flag that is set when slipping on ice), this flag sets the top speed to 363km/h for some reason. Speed 478 in hex is 0900h (2304 in decimal! 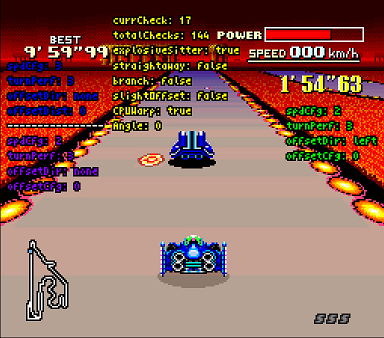 ), I guess the game has some sort of formula to display the speed without going beyond 999. I have already looked into this, I know where the code that slows you down is, but I couldn't find the code that increases the acceleration for a short period. Knowing that it uses the acceleration table will make it a lot easier for me to find that piece of code. Weird, I have never noticed that. I can try looking into it. That is probably possible by having multiple tables, each for a different difficulty. Yes they are very annoying xD, I think creating another "checkpoint property" byte for them would be too much, they normally use a random byte from the purple/green generic cars. I think disabling them completely, while allowing CPU warp, would be the best way. The game can actually keep track of 6 cars at a time (player and 5 CPUs), but the sixth car is only used when a player finishes a race (to show the CPU driving your car), if you set the "on race" flag for the sixth car while you're in a race the game will get really laggy. This sixth car also doesn't have collision with the player and it doesn't seem to have a rank. Hey Fennor, thanks for dropping by. Thanks so much for the download! The Legend maps recreated from the original game will be really helpful to me with making fzeeclips of certain turns. A lot of great tilesets in the fzeeclips folder too! I like what you've done with the Rebalanced hack. The Fire Stingray is just too overpowered in the original game, so having better balanced cars is interesting if done right. I feel like the cars from F-Zero 2 (Ace League) are all more balanced, but it has a negative effect to me, like they all kind of drive the same it feels like sometimes. No one car really stands out (maybe the Luna Bomber with it's top speed). You're right, there's a lot about Fuzee that most people don't take to their advantage. Like you mentioned speed is one of them. Another is the setting on the cars' tendency to slide around corners (if set at 3 they can turn really sharp turns with no problems). Also see the info about Bits under Checkpoint Properties and Machine-Sppecific Checkpoint Properties in Catador's document. That's odd about the speed increase only occuring when driving diagonally. "7E:1060: How many non-generic CPU machines are loaded. Probably used to make sure there are no more than 3 normal CPU machines on race. 7E:10D4: How many unloaded machines are in front of you, waiting to be placed on the track. Used as an index for 7E:1100 and 7E:1118 when a machine needs to be loaded again." I never knew that the Golden Fox's brake is faster than acceleration after hitting a boost. Reminds me that the speedrunners do something called break boosting (even with Fire Stingray I believe). What do you mean by starting furter down the grid? And you are right that the game keeps track of 5 cars. The author of F-Zero VS (which tracks positions of up to 4 players) said that he could have adden a 5th car, but that there was no room at the starting line. Put an F-Zero rom in the folder and rename it to input.smc and then run the program. It should make a output.txt file with comments. Do you know how to use the program with the opt_files? I think the maps didn't show the whole track, so I didn't know where the track would actually start. Horizontally it is clear where it has to be within one section (set of 16 tiles). Because you can only place the start/finsish checkpoint right in the middle of it. Vertically you can move it around, I just assumed that most tracks would also have the track in the middle of a section, this way it looks more "right" in the editor. I remember noticing that it could be wrong though. As far as I remember I moved one part of port town by 8 pixels to get the magnet stripes in their, I couldn't find the proper tiles without moving them. The 3 sections part seems accurate. On lower difficulties green and purple cars are slower than the main cars, and I believe the green ones slower than the purple ones. I think it also depends how far down the grid you are, the purple and green cars seem to get worse or drive a different line when you are behind. I feel like the cars from F-Zero 2 (Ace League) are all more balanced, but it has a negative effect to me, like they all kind of drive the same it feels like sometimes. No one car really stands out (maybe the Luna Bomber with it's top speed). Yes, I think overall it is a little bit better balanced. Lunar Bomber is about the same as Fire Stingray, maybe a little bit worse, but also depends on the track. Blue Thunder and Green Amazone are both better than Blue Thunder and Golden Fox. For some reason Fire Scorpion is about the same as Wild Goose, not a improved version. It is slower than the Blue Thunder, has worse acceleration, worse grip, loses more speed when not on the accelerator... Just like the Fire Stingray seems be better in everything, the Fire Scorpion is worse in everything. Grip is probably what has the biggest effect on making cars feel unique. Fire Stingray has shitloads of it which makes it feel much different from other cars. Lunar Bomber does not have that much grip, it feels the heaviest though with its high turning radius. In the original F-Zero weight feels more similar between the different cars. I myself set the turning properties for AI cars to the best for each checkpoint. I just layed out the checkpoints in a way that they form a realistic racing line. It was much easier for me to make them follow the line I want. If you make them slide, they will just be carried to the outside of the turn, try to move shaprly towards the racing line, overshoot and having to sharply turn the other direction again. That's especially extreme in GP Legend. If there is a combination of a few very light right and left turns, they will just slightly get off the line in the first turn, by trying to get back in the middle and overshooting they get even more off the line for the second turn, and at some point they will hit the wall. Actually Golden Fox can also do that trick with the boosts you gain every lap. With Golden Fox it just works the other way around. Fire Singrays braking ist much stronger than the speed it loses naturally. The boost sets you to ~525 kph, and as soon as you dropped down to 478kph it will jump up to 525 again. So if you break at 500kph you will get to 525 faster and spend less time at the low speeds of 478 - 500kph. With the Golden Fox you can break from 525 to 500 to stay at the speed longer, then release the brake until you get to 525 again. You would have to brake much more frequently though, and the effect is much smaller than it is for Fire Stingray. With WIld Goose it works the same way as for Fire Stingray, but also not as effective. For Blue Falcon it does not work at all, since braking is just as strong as not braking. The boost pad trick for Golden Fox works only when braking at the right speeds. The natural speed reduction is constant, while braking power depends on your current speed. At about 630kph both are the same, then you have to start braking. What do you mean by starting furter down the grid? You start in something like position 10. If you remove brown cars, it would be a good idea to give the player something that makes him busy. I understand why they implemented them into the game, they didn't want them to have an easy race as soon as you are in front, while struggling for the whole race just because you messed up in the beginning. The wipeout games have a similar philosophy. They let you start at the back of the grid, so that you are busy overtaking for the whole race. Which is more fun than just driving ahead of the field for the most time of the race. Rubberbanding is another way many racing games handle it. They are driving faster when they are behind and slower when they are in front, what feels more like being cheated on as a player though. The warp mechanic of the CPU cars is similar, but I think is even worse since it can instantly reset any gap you made. Maybe you would have to stretch the grid at the start, though. Of course you can't display oll 9 cars in front of you, so you have to make the 5th car - the last one you can see - far back at the horizon, while others in front spawn as soon as you catch up. - Make CPUs actually explode when falling off the track. I have finally made it! I have actually done that 2 days ago but it was VERY buggy (same car type would respawn, rank wouldn't update, etc). The way I currently made it doesn't seem to have any apparent bugs. In case you are wondering about the AI only moving sometimes, I also have a patch that lets me toggle the AI on-the-fly by pressing Select, which helps me a lot with testing this. At 0:05 in the video you can notice a green car spawning right after Fire Stingray is destroyed, that green car is actually the same destroyed Fire Stingray, just modified to look like a generic car. (It can either be a purple or green, chosen "randomly" depending if value from the frame counter 7E0051 is even or odd). To update the rank I'm just moving the destroyed car a few checkpoints behind (more precisely, 2 checkpoints), but I figured that is way too close from where the car was destroyed and I would not like people being able to actually see the cars (re)spawning. 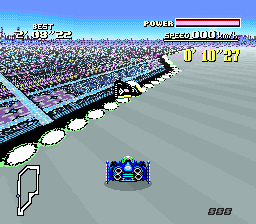 I'm still considering on whether implementing a health for CPUs or not, since the original F-Zero doesn't have any kind of offensive moves (besides knocking other cars off the track) and the CPUs barely hit walls (the only place where I see CPUs hitting walls without influence of other cars is in the last corner in Silence). There's something else I have done now, I made a LUA script for snes9x-rr 1.51 (not sure if the script works on bizhawk or whatever) that shows (almost) all the info about the player's current checkpoint, Fuzee users will most likely identify themselves because it's the same way F-Zero stores checkpoints (SpdCfg ranges from 0-3, TurnPerf ranges from 0-3, etc.). Another example of offset. You might notice "OffsetDist" is set to 0, but it actually does a little offset. 0 = little offset, 3 = maximum offset. To make no offset at all "OffsetDir" should have been set to "none". Ever wondered why some CPUs seem to drive into some of the Fire Field landmines on purpose? Take a good look at the green offset configuration. An example of "explosiveSitter" set to false. This configuration controls whether stationary explosive cars should spawn on this checkpoint or not. It is only set false on some places where it would be unfair and pointless (e.g right after a jump plate). Note that this config is ALWAYS set to false on the last checkpoint of all tracks! I have set the config to true on one track just to test out if something would change, it turned out that my rank would get screwed up when I finished a lap. This option isn't actually available in Fuzee for some reason. Really cool, keep up the good work. I was laughing at the video how you're just knocking cars off left and right because of the Pause function haha. I wonder what happens if you pause all the cars with the Select function and then re-lap them or finish the remaining laps with them paused? Since the game can only remember up to 6 cars their positions must be erased and you're driving on an empty track until you unpause everyone? Or does it pause up to 5 cars in whatever their position is and if you overlap them they still show up in the same spot because they saved right there? Fennor said that the green and purple cars drive slower than the main cars on the any difficulty below Master, so when a main car is respawned as a green/purple does that mean they also drive slower? This could make races too easy on difficulties lower than Master, but maybe not if they're not that much slower. It's up to you. In my opinion, I don't think it's needed. I don't think I've ever hit the others cars enough or seen them him the walls enough to the point that it would kill them if they actually had health. You can always write the ASM for it, but not use it so you have it just in case. However, if you're going to do the "Add booster to CPUs with a small chance of using them per checkpoint" edit then maybe it would make more sense for them to have health so that if every time they boosted it took away some of their health (like it does to a player when boosting in F-Zero X). Thanks for these! I had actually told Fennor in my original email to him how I tried to remake the BG tiles for Mute City and it took hours to scroll through all of the tiles in Fuzee to match the tiles to an image of Mute City's BG. I can't imagine how long it took you to reconstruct these. Yes, this is one of the functions in Fuzee that is seemingly never used by hack makers. However, it can be very useful in making races more difficult. Even a straightaway portion can be made more difficult if the main cars/green cars/and purple cars are all on different points on different checkpoints. Yeah, I have noticed this. They almost always crash into the mines on the left side, which the LUA script confirms. I think you should put a link to the LUA script and these image explanations in your document for anyone who might come across the document, but not this thread. Really impressive work on the script by the way. I wonder what point the brown cars drive on: main, green, or purple? I'll check in Fuzee and report back. Oh I see what you mean. I'm not sure this is a good idea. I know on Master difficulty I sometimes can be 1st the whole race and make one little mistake on the last lap and drop positions to lose the race. Combine that with starting further down the grid and the race's might be too difficult, especially for the average player. Lunar Bomber does not have that much grip, it feels the heaviest though with its high turning radius. In the original F-Zero weight feels more similar between the different cars. "At the time of the SFC [SNES F-Zero] we couldn't program individual unit weights but this time each one is different with respect to weight." I think they were already trying to give the cars from F-Zero 2 (Ace League) more of a sense of weight, but sadly this game was abandoned and work turned towards F-Zero X.
I wonder what happens if you pause all the cars with the Select function and then re-lap them or finish the remaining laps with them paused? Since the game can only remember up to 6 cars their positions must be erased and you're driving on an empty track until you unpause everyone? Or does it pause up to 5 cars in whatever their position is and if you overlap them they still show up in the same spot because they saved right there? Well, the sixth car (I like to call it "CPU Slot 5") is never used while in a race (lag! ), it's only used to demonstrate the CPU driving as you after finishing a race. It doesn't even have collisions with the player or a rank. 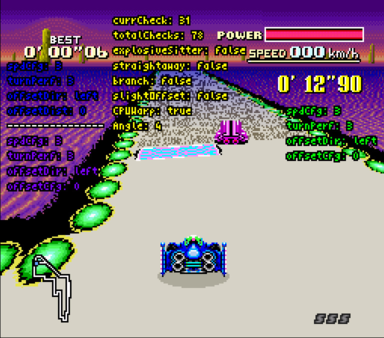 As you'd progress through the track, the game would keep warping the car in second place behind you (even though it has the No AI flag set), and the other cars would just stay there, as long as you didn't drive backwards (then the game would despawn the ones way up in front to place more on lower ranks). They actually keep their top speed, I didn't find a way yet to change it.. However, if you're going to do the "Add booster to CPUs with a small chance of using them per checkpoint" edit then maybe it would make more sense for them to have health so that if every time they boosted it took away some of their health (like it does to a player when boosting in F-Zero X). I was thinking about that, I think I'll add it anyways. I tried to remake the BG tiles for Mute City and it took hours to scroll through all of the tiles in Fuzee to match the tiles to an image of Mute City's BG. I can't imagine how long it took you to reconstruct these. I can probably easily find Silence/SandOcean/FireField's BG since they seem to consist of just one repeating row like BigBlue/DeathWind's. They seem to randomly pick the green or purple paths, since there doesn't seem to be extra bytes speciffically for them. I can tell that the Lunar Bomber definitely feels heavier, I don't really like playing with it (despite its top speed) because it can barely turn, it's like Black Shadow's car on some of the later F-Zero games, you can barely turn. In your video it is almost always on "true", but in Mute City II it seemed to get turned on and off all the time. Not sure what it is even good for except for branches, by having the cars that tend to drive more on the left take the left branch, while the others take the right branch. Maybe they can also overtake eachother better when they are not driving on the exact same line. I had it always turned off for my hacks, because I wanted them to make use of the whole width of the track. Having it on true would make some cars hit the walls. It also makes cars on the inside of turns perform better, since they have a shorter way. Especially if there is one checkpoint with slower speeds. The cars at the inside will have to spend less time on the slower checkpoint, so that they won't slow down as much before they can start accelerating again. @CatadorDeLatas: What hex editor did you use to change the tracks to the GP exclusive tracks in Practice Mode?! Great videos btw! That's right, although from what I've seen the option isn't "car specific" (still need to investigate this a little more to confirm!). If you unload Wild Goose, let some generic cars spawn and reload it by catching up with it again, there will be a chance that he'll be having a different "Slight Offset" direction. The actual direction seems to be tied with the "CPU Slot". When you play as Fire Stingray, the starting "CPU Slots" from 1 to 3 will have Golden Fox, Wild Goose and Blue Falcon. "CPU Slot 4" will always be loaded with the purple car. Car from "CPU Slot 3" will drive slightly to the left. Car from "CPU Slot 4" will drive.. somewhere. Not too sure exactly yet, I need to make a hex edit on a track to make sure the offset values from the Purple/Green cars are the same as the main cars so I can test this. Maybe they can also overtake eachother better when they are not driving on the exact same line. I believe this affects overtaking, since a CPU car that is directly behind another one will automatically slow down (to simulate a collision or something, not sure what the programmers were thinking) but when they are a little bit to the left or right, the game will automatically "push" (actually change the velocity direction) the car in the opposite direction of the other car instead of just slowing it down. What hex editor did you use to change the tracks to the GP exclusive tracks in Practice Mode?! You just have to know what bytes to edit. It's a little hard for me to explain right know what exactly is the format, but I'll just say that I have edited the 7th track configurations and also the checkpoint pointer to match Fire Field (or else you'd get Port Town II checkpoints into Fire Field, which wouldn't be nice). At ROM address 0x160F9 (headerless) there is a table of 24 pointers (16-bit) to the checkpoint information, the first 15 are for the GP tracks, the last nine are for Practice (though you can't scroll beyond track 7 in Practice). I just modified the value at address 0x16123 to 3AE0 (the same as the 15th value, which is for Fire Field). - E = III (if Mute City), II (If has variations e.g Port Town) or no variation (if has no variation at all e.g Silence). Other values will read junk data and send you to a corrupted track. - 8 = White Land. Other values will freeze the game. The reason we can't scroll beyond 7 is to prevent a game breaking glitch! Tracks 8 and 9 in practice mode can be buggy when you finish the race in those tracks! 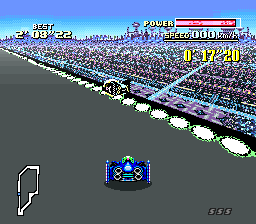 If you use the 'F-Zero Tracks Unlocked' patch for Practice mode, you also have Tracks A, B, C, D, E and F with Tracks B and C also being a bit buggy when you finish the race in those tracks! Tracks 1-7, A, D, E and F: Works Fine! Tracks 8, 9, B, C: Buggy! Big thanks to CatadorDeLatas, I was able to change the Track Lineup to the GP Exclusive Tracks so you can play them in Practice Mode! Here's a set of Patches that allow to play the GP Tracks in Practice Mode! Both patches have been tested and works with no problem! Patch to an Unheadered (U) ROM and enjoy! Note: I left tracks 2-7 in Patch 2 as is! I've been working on the CPU Health thing. Good news is that it works (partially), it even takes in account the CPU car type! (GFox will explode faster, WGoose will take longer to explode). Bad news is that there was an annoying bug and I didn't seem to spot what caused it. I tried debugging for something like 30 minutes and got sick of it. - If you make the boost work like in F-Zero X, you probably want the CPU drivers to trade health for boost power. That means you'd want them to drive on the refill areas, how would you handle that? Just making them drive there on default would create chaos at the start, since usually the refill areas are right after the start. You would need a different route in lap 1. Maybe the best way would be if you lead the ai path through the pits, but have the "goStraight" checkpoint argument on true, but set it off somehow at the end of the first lap? - As far as I know, all cars have the same amount of health, they only differ in damage recieved and regenerated, is that right? If boost drains a set amount of health, that would make boots really strong for the Golden Fox, but weak for Wild Goose, since the Golden Fox can refill it much faster again. So the health of cars may need to be rebalanced. - You said you wanted to make them use the boost "randomly". So even at turns like the middle section in White Land II? Or will you set some checkpoints to allow or not allow boost for CPU? I'd like them to boost at specific checkpoints, especially since - if it really works like in F-Zero X - boosting once in a while is less efficient than boosting multiple times in a row at certain spots. -I am not sure how it exactly works in F-Zero X. But I think the acceleration bonus is added to the normal acceleration. Above the top speed, you have a slow decceleration, so that with a boost you have a slow acceleration. If you get even faster, the natural deceleration and the acceleration from the boost even out. When you are even faster through other sources, you decelerate slightly even when boosting. 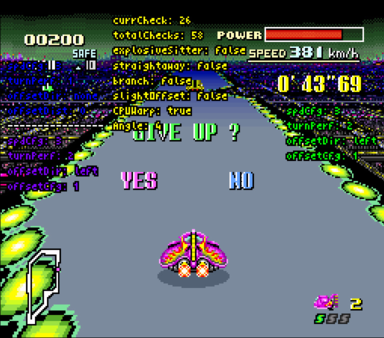 In F-Zero SNES you have a constant deceleration when being above top speed. Having a constant acceleration above top speed, simply limited by a top speed for accelertion - not by acceleration - could be problematic. Because in that case it would be best to boost until you reach boost top speed, then stop boosting, start boosting again when it would be just enough to reach boost top speed again, then stop boosting again and repeat. Which also sounds a little cheesy.